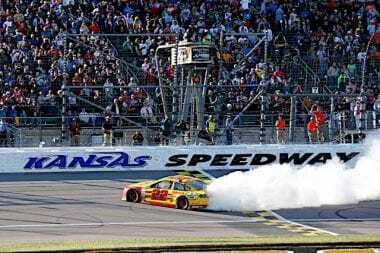 Joey Logano Spins Matt Kenseth to win at Kansas Speedway. Watch the video from today’s racing action below. KANSAS CITY, Kan. – Block me once, and I’ll cut you some slack. Block me twice — and it’s “Gotcha.” That, in essence, was the conversation on Joey Logano’s team radio after Logano spun race leader Matt Kenseth in Turn 1 with less than five laps left in theHollywood Casino 400 at Kansas Speedway. Logano went on to win the race after a green-white-checkered-flag restart that sent the race two laps past its scheduled distance of 267 laps. The driver of the No. 22Team Penske Ford has monopolized the Contender Round of the Chase for the NASCAR Sprint Cup, having won back-to-back races at Charlotte and Kansas. 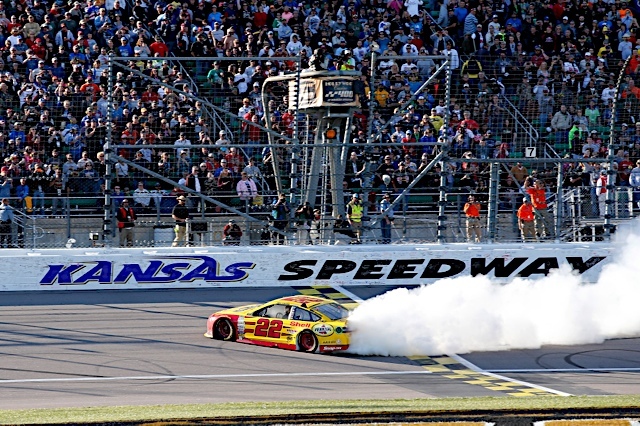 The victory was Logano’s second at the 1.5-mile track — the first coming in last year’s Chase — his fifth of the season and the 13th of his career. But it may have come at the expense of the title hopes of the driver who replaced him in the No. 20Joe Gibbs Racing Toyota. He finished .491 seconds ahead of runner-up Denny Hamlin, who held offJimmie Johnson at the stripe to take the second spot. Johnson ran third, followed byKasey Kahne and Kyle Busch. Desperately needing a victory to revive his chances to make the cut for the Chase’s Eliminator 8 Round, Kenseth had grabbed the lead from Johnson after a restart on Lap 248. Using all his skills to keep the faster car of Logano behind him, Kenseth blocked Logano on the frontstretch as the duo ran up on lapped cars near the start/finish line. Kenseth moved up to block again as he entered Turn 1, but a tap from Logano’s Ford sent the No. 20 Toyota Camry spinning. A wide variety of issues befell several Chase hopefuls, making the task ahead of them that much more difficult in next weekend’s elimination race at treacherousTalladega Superspeedway. Dale Earnhardt Jr. was the first Chaser to encounter problems, losing a lap during an unscheduled pit stop for a loose wheel on Lap 165. Coors Light Pole winnerBrad Keselowski pressed on after a slight scrub against the Turn 3 wall on Lap 188, then Kyle Busch encountered his own brush with the wall just six laps later. A pair of Chase contenders found issues during an exchange of green-flag pit stops with 52 laps to go. Kevin Harvick’s Stewart-Haas Racing No. 4 crew was penalized for removing equipment when his gas can fell outside the pit box. Martin Truex Jr.’sFurniture Row Racing team was hit with a penalty for an uncontrolled tire. Both served pass-through penalties and fell a lap down to the leader. Only Harvick, who wound up 16th, and Earnhardt (21st) failed to recover for lead-lap finishes. The rest of the Chase field’s results: Kurt Busch (sixth), Carl Edwards(eighth), Brad Keselowski (ninth), Jeff Gordon (10th), Ryan Newman (11th) and Truex (15th).